I come from a long line of great pie makers. This post is all about what that means to me and my efforts to preserve our family’s pie-making prowess with a pie-making lesson with my Mother. The recipe is in this post. A video follows in Pie 201. Every Sunday, when I was a little girl, we went to my Great Grandparent’s (Aileen and Willard Dyer’s) home for Sunday dinner. “Grammy and Puppa” as we called them, didn’t have a lot of money, but they opened their home and their hearts wide and we usually had about 12 – 20 of the family there for dinner each week. The meal I remember Grammy serving most frequently was her simple and highly economical baked peas and beans with loaves of fresh bread. The beans were thick with Crosby’s molasses and the peas had bacon and big onions infusing them with flavour. Sometimes we’d get a roast of pork or a big turkey with lots of vegetables from the garden. There were always preserves from the cold cellar. I remember pretty little glass bowls spread down the table filled with ruby coloured pickled beets, tomato chow-chow and an old New Brunswick favourite, Lady Ashburnham mustard and cucumber pickles. The men usually gathered around some old car that Puppa was trying to keep running and the women might work on a quilt Grammy always had set up in her parlour. My siblings and cousins and I loved to play underneath the quilt and pretend we were in a great tented world. Sometimes we walked to the spring in the woods above the little house to fetch a pail of fresh pure water for the night’s meal. I remember washing up at the pump at the big sink, using bars of bright yellow Sunlight soap. I still think of the smell of that soap as one of the cleanest smells in the world. As I grew older I got to help set the table. Grammy would open a fresh package of butter and she took care to show me how to use a knife to scrape the wrapper to get every last ounce of the precious pale gold. It tasted so sweet and delicate on the fresh bread the came out of her wood stove everyday. These are all memories that I cherish but to be completely honest, the highlight of every single one of these Sunday dinners was having a piece of one of Aileen’s pies for dessert. In spring there would be strawberry rhubarb. A hot summer day might bring a coconut, banana or chocolate cream pie out of the ice box. Late summer was for blueberry or raspberry and fall brought apple and pumpkin to the harvest table. Mid-winter, when all her fruit supply was gone, she would break into some Jell-O pudding and we’d have a pudding-centric pie like butterscotch or lemon meringue. I can remember, staying brightly awake until I had a piece of pie and then climbing into one of the rocking chairs by the wood stove and falling promptly asleep and having to be carried to the car for the drive home. Such sweet pie filled dreams I had. I was in grade 9 when my dear little Great Grammy died. 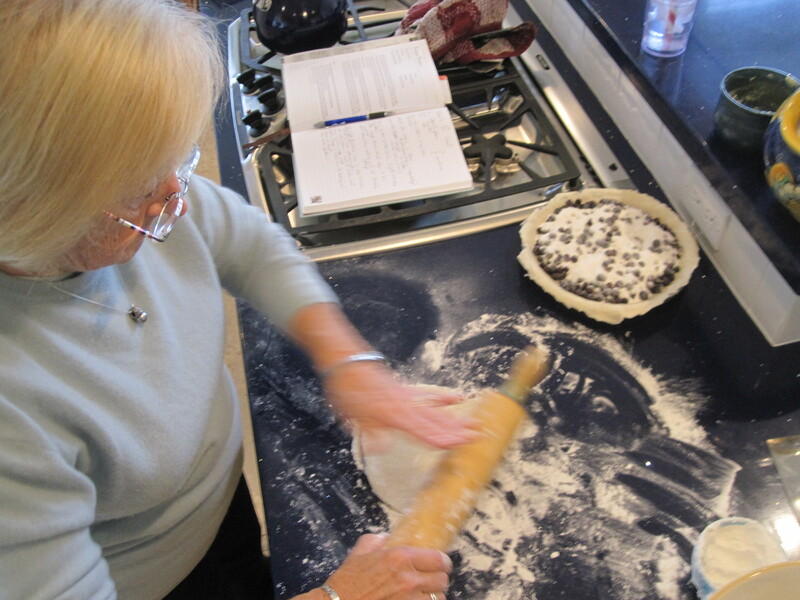 Fortunately for everyone in my family, my Mother – Gerri Robicheau – carried on Grammy’s legacy and is the most wonderful pie-maker I know. For several years now she has come each November (once her golf course closes!) to help me make pies and tortieres for my friends for Christmas. I’m getting pretty good at pie making now and I realize how fortunate I am to be so lovingly mentored. I might have grown up with two grandmothers and a great-grandmother within 20 miles of my home but now that I’m thousands of miles from my own dear Mom I don’t take her and all her knowledge for granted. I know that not everyone comes from a background so rich in culinary skill so I’ve decided to write this blog and lend you my Mom’s skills as a mentor. 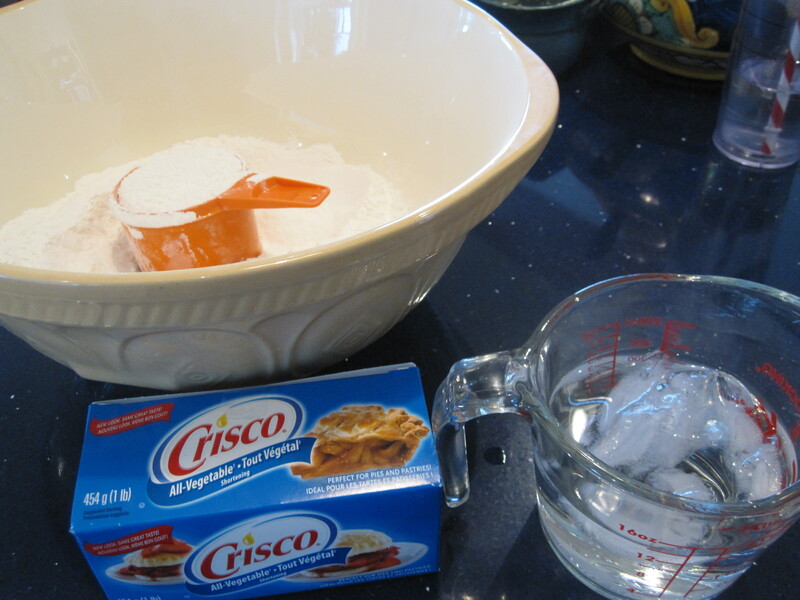 Ingredients: 4 level cups of flour, 1/2 tsp baking powder, 1/4 tsp salt, 1 lb chilled Crisco shortening, ice and water to fill a 2 cup glass measuring cup. 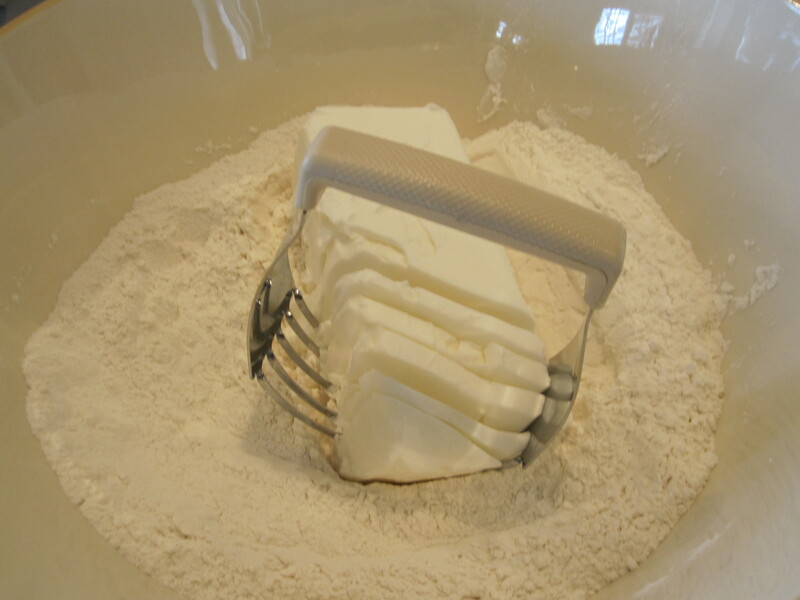 Blend the shortening and flour with a pastry blender until course pea sized lumps form. 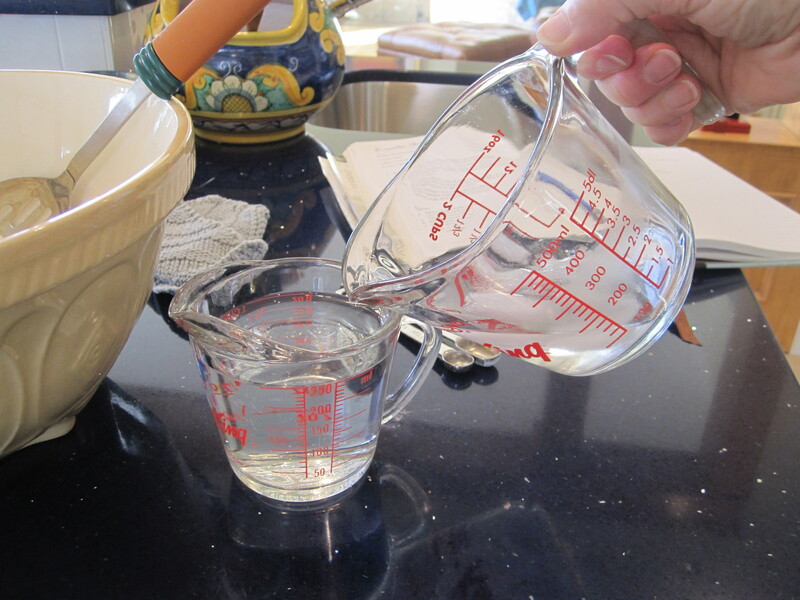 Now measure 25o mls of ice water into a second pitcher (be sure it is 250 mls not just one cup as 250 mls is slightly more) and pour that into the center of the shortening and flour mixture. Stir with a metal slotted spoon to get it to come together. 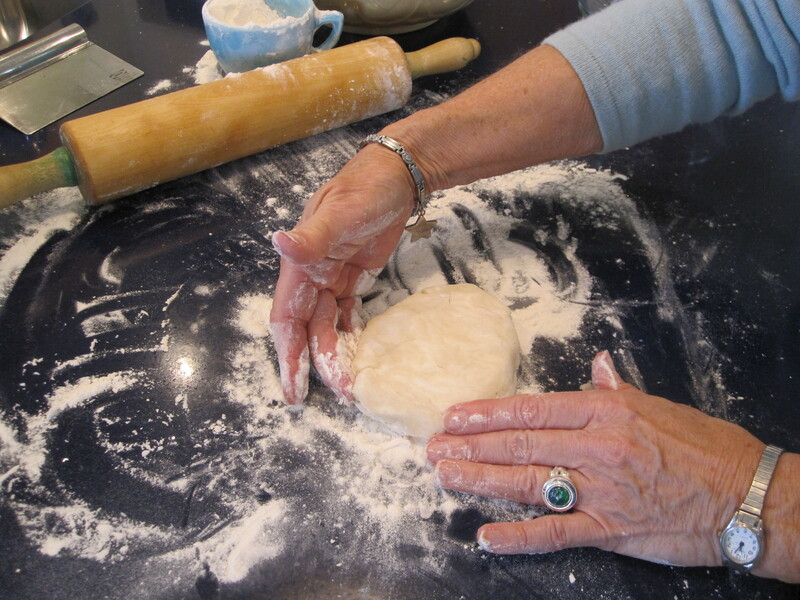 Use a dinner knife to shape the dough into a mound. 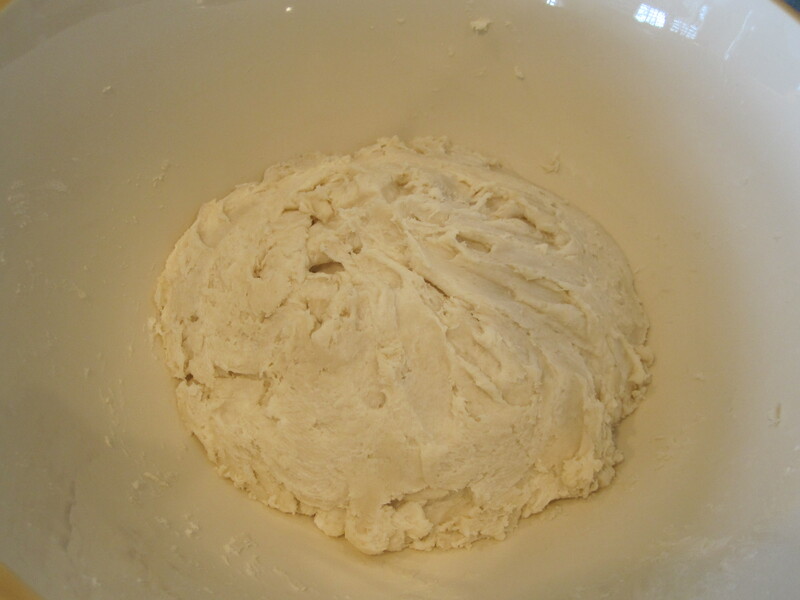 Let the dough rest in the fridge for 10 minutes to firm up. Cut the dough mound into 8 unequal pieces. You want four slightly larger portions for the bottom crusts. Choose a portion and remove it and use your hands to shape it into a disc. Flour a flat surface and roll your rolling pin through the flour. 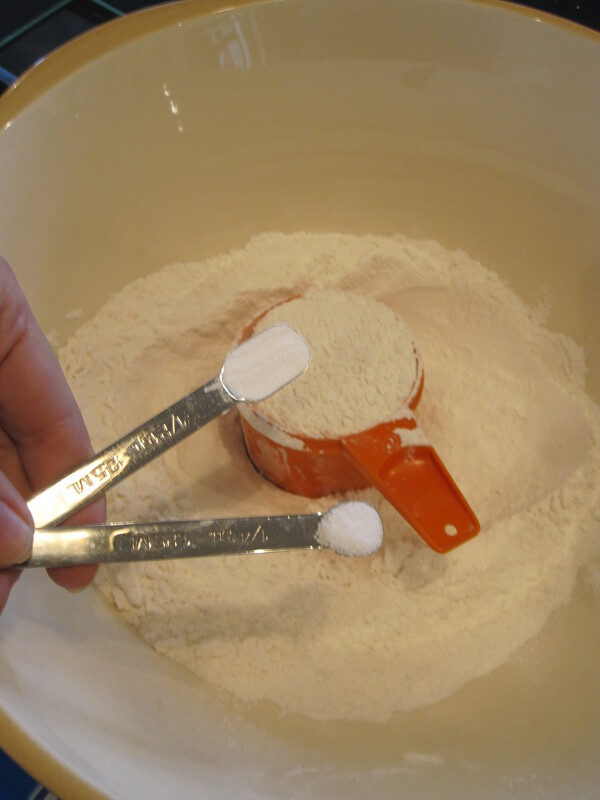 Place the disc on the floured surface and begin to roll it out pressing lightly with the rolling pin from the center out. 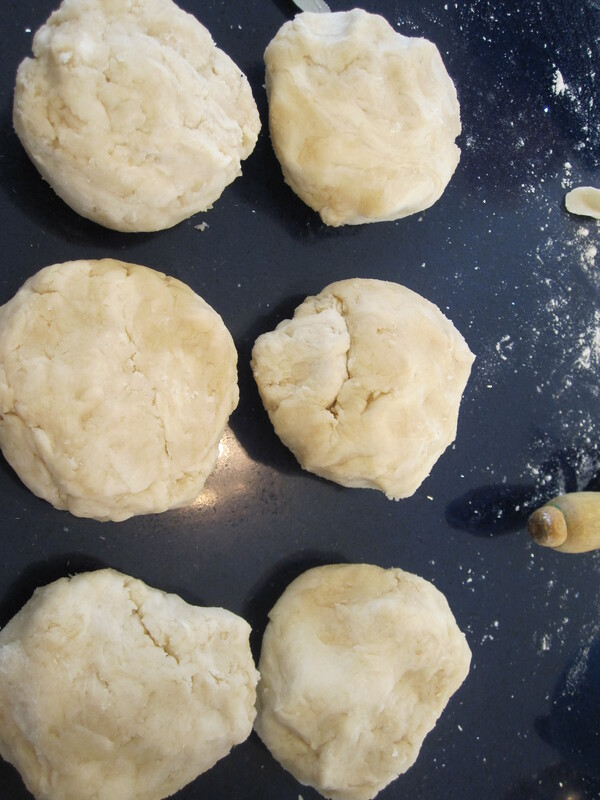 Use very light pressure and move the rolling pin around to keep the dough forming a round shape. 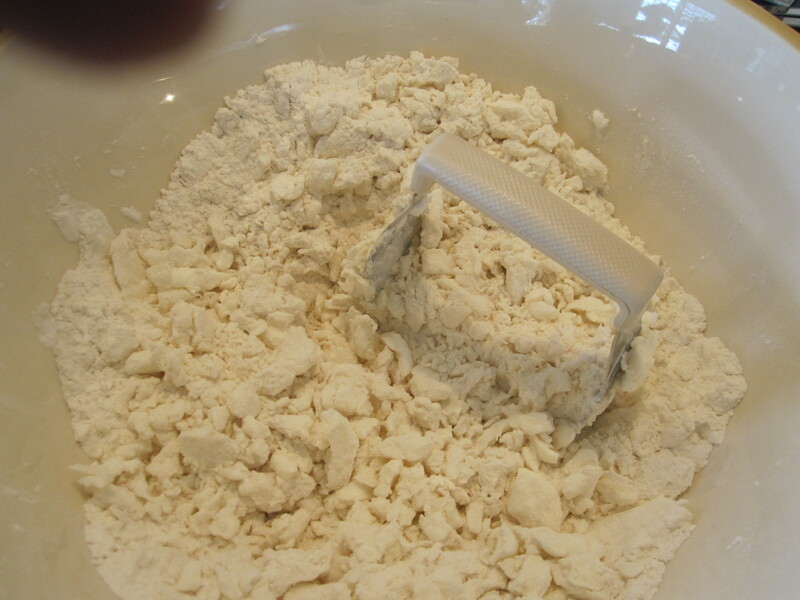 Lift the dough as necessary and sprinkle the surface with more flour to keep it from sticking to the cupboard. 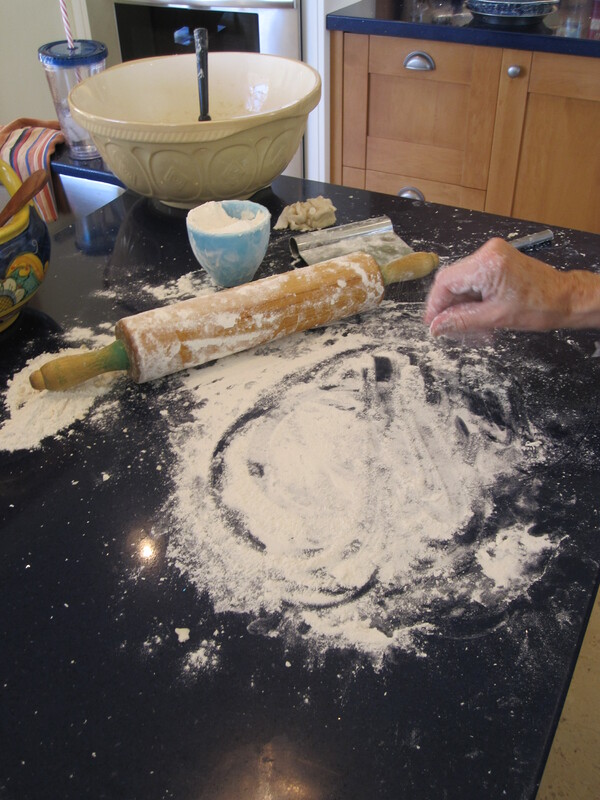 Fold the dough over your rolling pin and transfer it to the bottom of a pie plate. Add fruit to the pan. 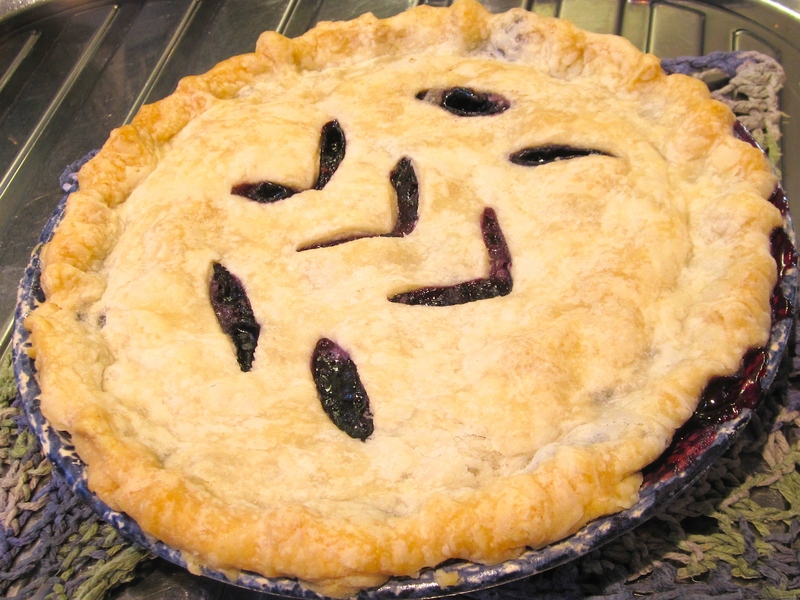 For blueberry pie, we add a mixture of 1 c sugar, 3 tbsp flour and a few drops of lemon. Depending on the sweetness of the fruit in your pie, you may need a little more or less than the 1 c sugar. Prepare the top crust as above and top the fruit with it. 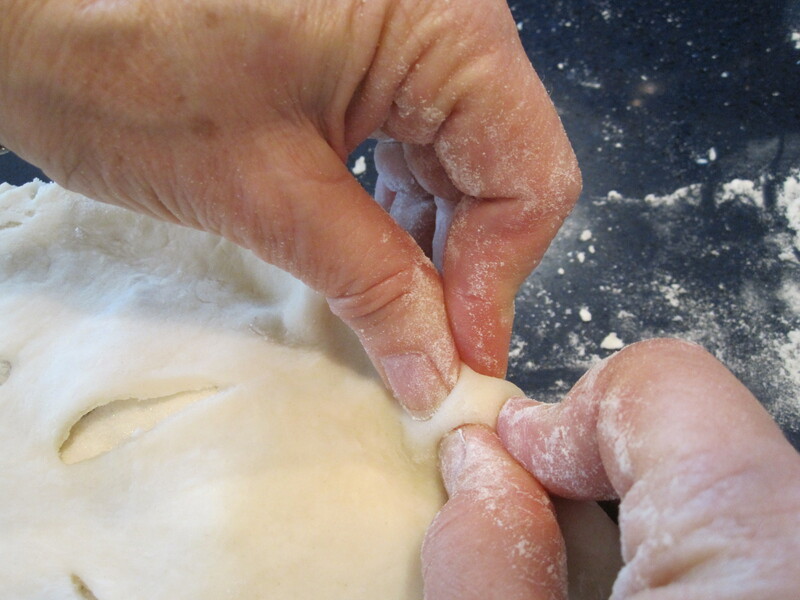 Crimp the two crusts together by folding the top over the bottom and then pinching the dough lightly between the thumbs and forefingers of each hand. Cut vents in the top of the pies. Bake at 350 degrees F. for 1 – 1.5 hours or until the juices are thick and sticky. Enjoy immensely. 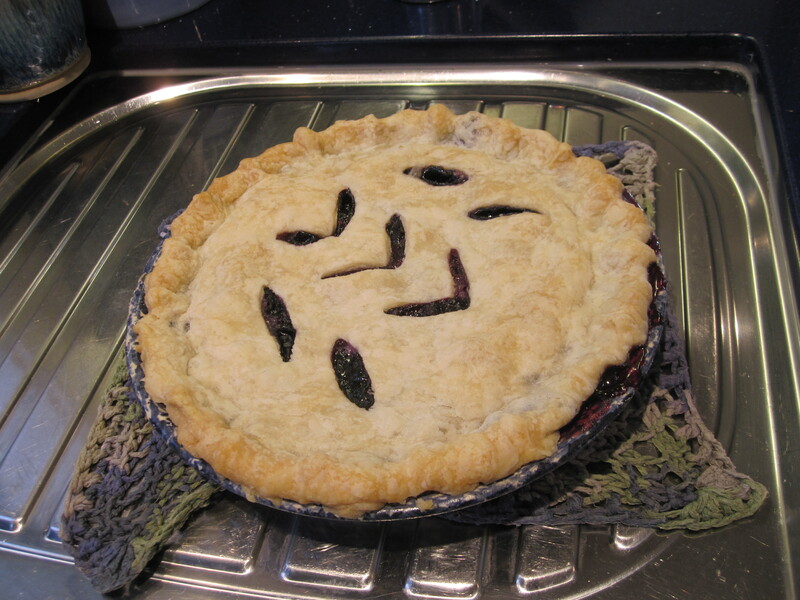 This is fantastic Karen – I have never come across such a step by step outline to the perfect pie and will enjoy trying the process again. Hopefully with way more success this time! Thanks very much for sharing. Thanks so much Anne. The video is where all the real tips are. I can’t believe all the little nuggets of pie wisdom my Mom has but then, she learned from her grandmother and my great-grandmother was an amazing cook. She did all her cooking on a wood stove, everything by feel and I remember finishing all Sunday dinners at her home with her famous flaky delicious pies. Thanks for leaving a comment. I sure appreciate it. K.
I’ll check out the video Karen. My mom was a good baker but pies were never part of her repertoire – or more likely, they were but I wasn’t interested in learning when I lived at home! Happiest of holidays to you and the family.